Jalisco Cafe is one of those places that seems to be known almost exclusively by word of mouth. I am guessing it has been operating for at least forty years, but regardless of its history it has built up a customer loyalty that is matched by few other restaurants in El Paso. The area of South El Paso, located between downtown El Paso and the Mexican border, is one of the city’s most historic areas. The neighborhood is little changed from the early twentieth century except for the upgrade and modernization of many of the former tenements. 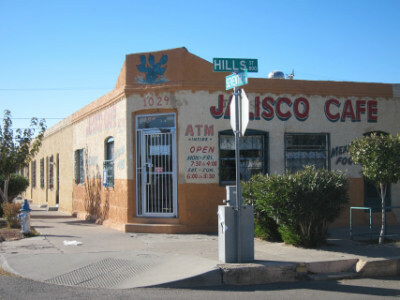 Jalisco Cafe is adjoined by several small apartments that give it the feel of being a true neighborhood restaurant. 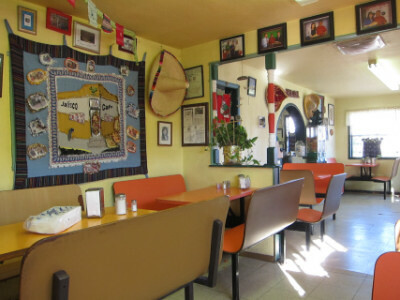 When I used to eat at Jalisco on a regular basis during my lunch hour I observed almost as many customers ordering take-out as were dining in the restaurant, and I think Jalisco Cafe has become an integral part of the neighborhood’s life. Other restaurants have come and gone over the years, but most people have considered Jalisco to have higher quality food and have continued to patronize it as much as possible. Jalisco offers special dishes every day, as well as a regular menu that serves lunch portions of food at lunch prices. By this I mean that people will not fall asleep when they go back to work because of overeating at lunch. One of my biggest gripes with El Paso restaurants is that they serve portions that are too large, but most places do cut it back somewhat for their “lunch specials.” Since Jalisco Cafe only serves breakfast and lunch, quantities are already geared toward the amount of food that is comfortable for people during these times of the day. One reason lunch portions are kept small is so every customer can enjoy a bowl of soup before the meal. This is actually filling enough to serve as a meal if you order the large size, but a small one will leave room for one of the lunch plates. I have probably eaten just about all of the lunch plates, but because of my advancing years I am not going to try to give reviews of them by memory. Like most of the more authentic restaurants that prepare food much the same as in Ciudad Juarez (which in the case of Jalisco Cafe is only a few blocks away), the enchiladas were one of the items that was least memorable to me. I think Jalisco Cafe excels in the variety of foods it offers, such as tacos, stews, and even mole (served as a special on Wednesdays). I am not saying to avoid the enchiladas, I just did not make a mental note of them being among the best in the city. While the food at Jalisco is true to the heritage of most Mexican food in El Paso that originated across the border in the state of Chihuahua, it also falls into what I call the “El Paso” style of Mexican food in offering more flavorful salsa than is usually found in Ciudad Juarez with less garlic and other ingredients that would tend to adulterate the chiles, better chips, and the variety of foods that are served in many El Paso restaurants. In fact, El Paso is somewhat of a “melting pot,” taking the best of Chihuahua cuisine but adding dishes from other places in Mexico as early residents and recent immigrants contributed them from their list of recipes. I think Jalisco Cafe offers the flavors of Chihuahua with a more consistent cooking quality than is typically found south of the border. One place the quality of Jalisco Cafe can be seen is in the home made Corn Tortillas served with soup, and probably by request to anyone who wants them. These are so light and fresh that I think I have probably unconsciously used them as the standard for other restaurants in the city. I say “unconsciously” because I pretty much took for granted that El Paso had excellent tortillas until I found out otherwise by visiting other restaurants, particularly some of the ones in the suburban shopping malls. I am not sure how tortillas are usually made, but the ones here are thin and firm without being too hard, and have only the basic ingredients needed to provide a good taste. It would probably not be an exaggeration to call the Caldo de Res the signature dish at Jalisco Cafe. This is another dish I took for granted until I found out that few other places could come close the quality of Jalisco’s. Just as the excellent tortillas are an integral part of enjoying this beef soup, so is the fact that the caldo is simmered long enough to infuse the flavors into the broth, give the vegetables the right texture, and make sure everything is cooked just right. I think the problem with most caldos served in El Paso (and even more so elsewhere) is that the vegetables either remain in their raw state, or else they are overdone. I think Jalisco also uses herbs and spices in a way that few others have mastered. While a good quality caldo can be made with lower quality cuts of beef, Jalisco excels by using high quality, non-fatty pieces that again make this one better than the caldos found at other restaurants. Limes are provided to cut down on the greasy flavor of the caldo (from the beef fat), but at Jalisco the limes are mainly for flavor since the grease is at very low levels. The caldo in my photo is the small version usually ordered before patrons indulge in one of the lunch plates, but a large version can also be ordered that would pretty much serve as a meal in itself. 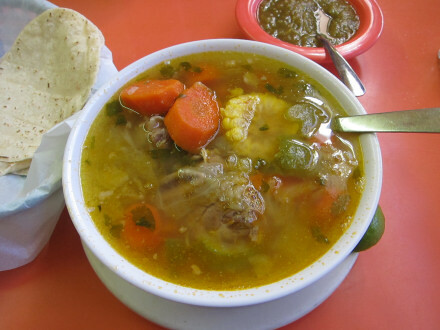 In either case, if you can only try one caldo de res in El Paso, Jalisco would most likely be my suggestion. If there are others that are better I have not found them. The plate dinners at Jalisco are not large in size, but they pack a large amount of flavor into what they serve. 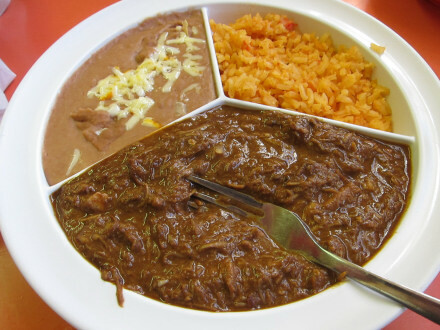 For instance, the Chicken Mole served on Wednesday is made in the traditional style from Puebla, Mexico. It comes in a dark brown color with what many describe as a “chocolate” flavor, although it is much more complex than that. I find the mole at Jalisco to be very similar to the ones served at other restaurants, except for the fact that the chicken here is shredded into very small pieces. Mole, the daily special for Wednesday, is only available on this day (I do not know if the same is true for other daily specials). It was not any more or less expensive than the other dinners, but I can say that I enjoyed it more than I have with some of the regular menu items I have tried in the past. In this respect it was truly a “special item” to me. The items I tried years in the past are not ones that I will include in the review, but I can say that they have the full range of popular Mexican items. The ones that stick out in my mind as being good are the tacos and stews (chile verde, chile colorado, etc.). Jaslisco Cafe does not have a full line of aguas frescas drinks, but the Lemonade is home made and is typical of this type of Mexican style drink. I thought it was a little too sweet, but it was very good. I do not find myself downtown at lunch time very often any more, but Jalisco Cafe remains one of the better choices in the area. It is a little off the beaten path, located on a neighborhood street, but it is well worth searching out. The dining room is rather small, but you know you are getting something authentic. One thing many people will appreciate is that fact that although it is located very near the Mexican border, you do not need to know any Spanish to communicate with the staff. Also you do not need to bring a lot of cash (Yelp says they accept credit cards but it is so cheap I do not bother with this).